Kelly O’Hanley’s interest in the environment was not new, but resistance and direct action were. She considered her work in ob-gyn and International Public Health one solution to environmental degradation. After screening An Inconvenient Truth by Al Gore at her church she became deeply concerned about global warming. In retrospect, she feels that the film left us hanging without ideas for actions commensurate with the problem. “I tried to get my church to change light bulbs,” she said. It was clearly not enough. 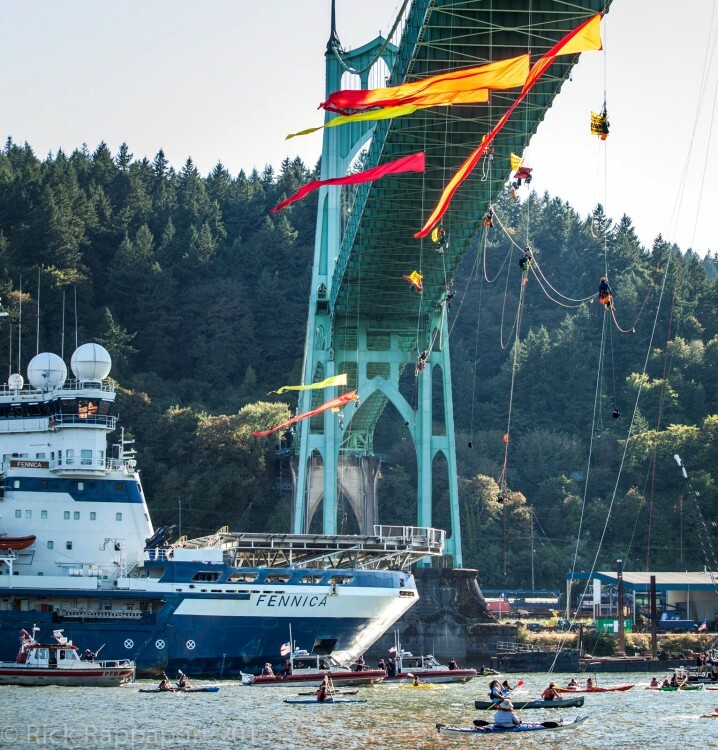 A few years later she attended a Greenpeace meeting and learned about civil disobedience. The opening question for one-on-one sharing was “Have you been arrested?” That got her attention. She took more trainings on non-violent civil disobedience and began a rewarding journey. That journey has included leafleting, bird-dogging elected officials, flash-mobbing, lobbying, infiltrating political meetings, testifying at hearings, art-making, petitioning, laying on train tracks, peacekeeping at marches, speaking at rallies, teaching adult study, and more. 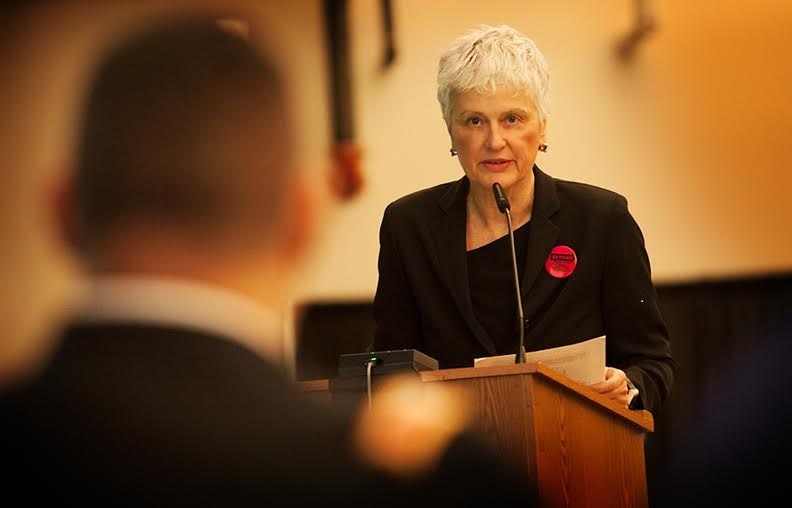 She was active in influencing Portland City Council to oppose building any new fossil fuel infrastructure. Kids are powerful advocates and are more aware and willing to be involved than we think. Art, music and storytelling are vital to powerful communication. Most of our power is local – and that power is far greater than most of us know. A small group of committed people can move mountains. Most activists are not necessarily Christians but they are deeply moral people. Most Christians are not necessarily activists. Let’s change that! We fear doing what we haven’t done before but getting over those fears is life changing. Meeting and scheming in the name of climate feels like it might have felt during earliest days of the church. O’Hanley wonders why, with so many avenues for action, are we so asleep, especially in the church when we know what global warming is doing to our planet. Jump in! The water is fine, and it will be an adventure with many companions on the way. Jenny Holmes lives in Portland, Oregon with her husband John and dog Verda. She is coordinating the 2017 PEC Conference Coordinator and is a past PEC moderator. 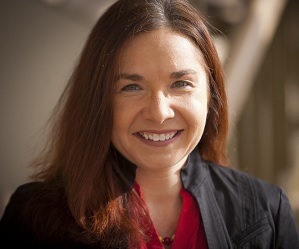 She also works for Southern Utah Wilderness Alliances as the WA-OR Field Organizer and is former Environmental Ministries Director for Ecumenical Ministries of Oregon. My husband Pete once remarked that he was a novice. 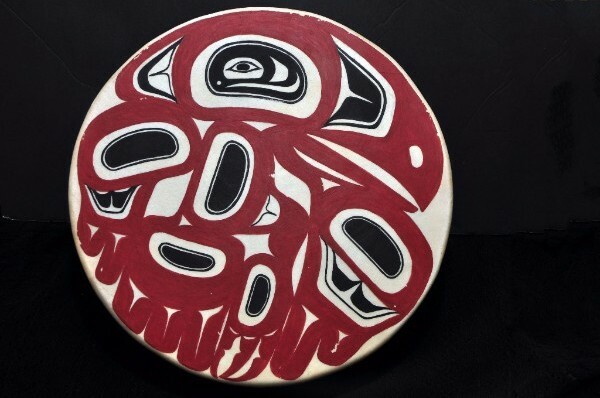 I am also a novice, of the Alaska Native artistic culture, once removed!! Almost any Native Alaskan carver could call me out and state that I need to study a lot more. What I am able to recall from my late husband, is just that-- a recollection, so please accept my apology in advance for my errors. The most important thing for First Nations people was survival. This explains how they came to view eating and celebrating as essentially life-giving. Eating is also a sign of wealth. 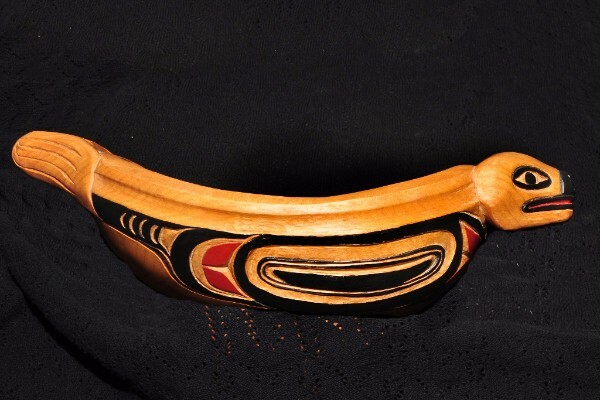 Potlatches and sharing of goods in an abundant manner was a way of showing your wealth. The art was also a means of expressing what was/is important. The art and culture that my spouse studied with Alaskans and carvers, had a near reverence for cedar, both yellow and red. The early artists used colors that derived from natural earth elements: burned wood, graphite, flowers and sometimes eggs. Black and red often represented death and life respectively. Sometimes, that was a death of a plan or an idea. The shape was also important, such as the shape of the eye on a sea creature was to remind the observer of the life-giving salmon (egg). The Rev. 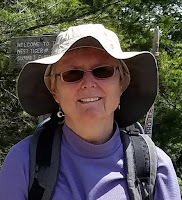 Judith Ann Richards of Underwood, WA is helping to plan worship for PEC's “Blessing the Waters of Life” conference and is a member of the PEC Eco-Justice Team. She was serving a church in Ketchikan, Alaska when her husband, a Presbyterian ruling elder, created these carvings. Harold "Pete" Richards, passed away in 2013. He was an educator who taught at the high school level. He loved to work with wood and loved God's Creation. While in Ketchikan Alaska, he assisted and developed plans to repair many churches throughout Southwest Alaska. About the images: (clockwise from top left) Drums were an important part of story telling, and celebration. Painting the drum elevated the percussion instrument in acting out a story. 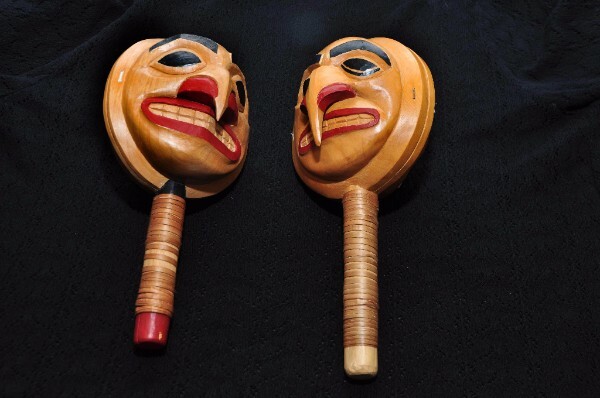 Pair of dance rattles, a raven and eagle. A fish bowl. 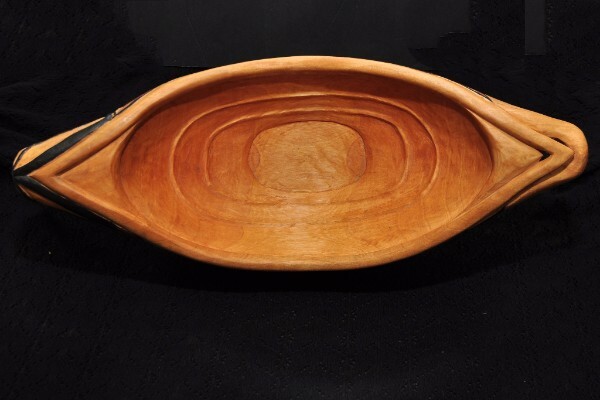 A greasebowl was filled with a fish oil that was wonderful for cooking, eating and showing of abundance. The inside rim was placed in the bowl to scrape off the spoon. All by Harold "Pete" Richards. 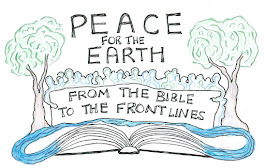 We have been asked to write an article to share some experiences where our lives and ministry have intersected with issues of Earth care, First Nation tribes, and water. An early “formative” story. We both grew up in different towns on the eastern side of the Sierra Nevada Mountains in California, a dramatically beautiful, high desert region. One thing that connects all the towns in this valley is the Los Angeles Aqueduct (completed in 1913). Through subterfuge, the City of LA took the water rights of the Owens Valley farmers and built a long “snake” (aqueduct) across the foothills of the Sierra, capturing the “run off” water and diverting the river water to quench the thirst of the growing San Fernando Valley, a suburb of LA. The economy of the Owens Valley was ruined. We grew up listening to the stories of families losing their fruit ranches ~ their trees, their crops. The city of LA hired a private militia to keep the farmers away from the construction. There was blood shed and people died. Jim went to school with Western Shoshone Paiute students who shared their life stories. Our ministry. We were both raised in the church, with parents who stood for the marginalized ~ who cared about the earth. Our talents in music were welcomed by our faith communities. We found each other 45 years ago and have shared our passion for justice as we have written and sung, encouraging others to walk in beauty with each other and our Earth. In 1995, we, along with our son, Michael, created their Celebration for the Healing of the Earth ~ a multi-media project, built upon parts of the Christian mass, enhanced by the wisdom of many faiths, especially the Native American and Australian Aboriginal people. A favorite piece in this work is the “Sanctus” in which a choir of wolves and a choir of humans sing the “Holy, Holy, Holy” into the night. Climate Vigil for United Methodist General Conference, Portland, OR. 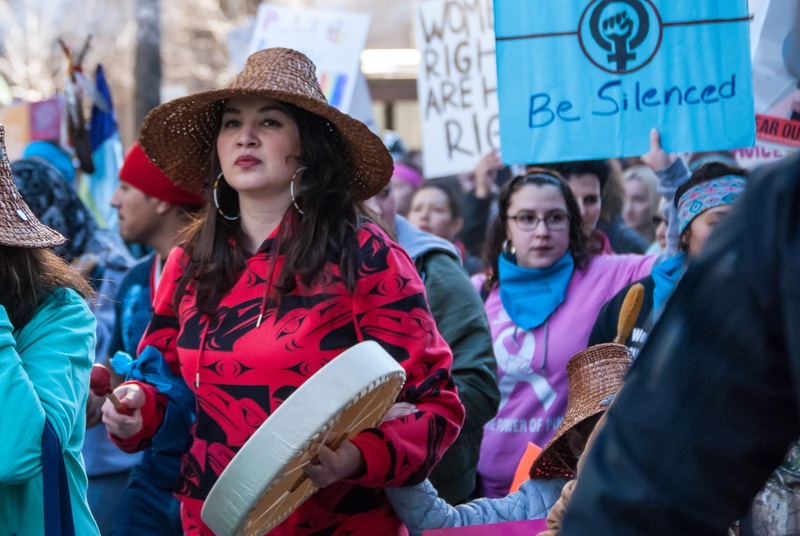 At this Global meeting of United Methodists, indigenous people from many continents shared their stories of how changing climate, and its social and political consequences are endangering their very survival. We created call and response chanting to weave into their testimonies. Elders of the Mindanao from the Philippines were powerful in their witness. noDAPL rally in Auburn, CA. We did not join the Standing Rock Sioux in North Dakota, but supported their amazing effort locally at an interfaith rally where we led more call and response singing. This rally included a blessing of the people who were on their way to North Dakota. said, here we make our stand. We stand and pray together! I Don't Believe in Climate Change. I Believe in God. I Don't Believe in Climate Change. I don’t believe in climate change. I believe in God. I believe He created this amazing planet we live in, and gave us responsibility—or stewardship—or dominion over it. I believe God delights in his creation and wants us to, as well. And I believe we are to love others, especially the poor, the vulnerable, and those most in need, as Christ loved us. I’m a Christian – but I’m also a scientist. I spend my days studying how climate change is affecting us, in the places where we live. Rainfall patterns are shifting, sea level is rising, and weather is getting weirder: when we add them all up, there’s more than 26,500 separate lines of evidence that the planet is warming. I don’t believe in global warming. The evidence of God’s creation tells us it’s real. Nearly two hundred years of meticulous scientific studies has established that it’s not a natural cycle this time: it’s us. And my own research demonstrates the severity of the consequences for all of us, particularly those less fortunate than us who are already suffering. We care about a changing climate because it exacerbates the risks we face today: hunger, poverty, disease, and injustice. Yet when we hear Christians discussing climate change, often the predominant responses are negative: hostility, anger, and denial, a stew of toxic emotions underlain by fear. Fear of losing an identity that’s based on politics and ideology, if we get on board with a “liberal” issue; fear of rejection by our family, our community, even our church; or fear of losing our comfortable lifestyle in search of what’s right and just. As Christians, we have a litmus test for these emotions. Because, as the apostle Paul writes to Timothy, “God has not given us a spirit of fear, but of power and of love and of a sound mind.” So when we see people responding in fear, we know that’s not who we’re meant to be. What gifts does God give us? Power, to effect meaningful, long-term change. Love, to share God’s heart for our brothers and sisters who are hurting and in need. And a sound mind: to look at the reality of what is happening in our world and acknowledge that yes, climate change is real, it’s serious, and we need to fix it. Being Christian isn’t a hindrance to acting on climate. On the contrary, if we believe we’re called “to do justice, to love kindness, and to walk humbly with our God,” then caring about a changing climate, and those already suffering its impacts, is what we’ve been created to do. It’s who we are. Let’s Meet at the Intersection! Two years ago, at PEC’s Montreat conference, J. Herbert Nelson told us to get out of the room and into the streets. It sounded fabulous when he said it but I had no idea what that might look like. On the streets of Seattle, my husband and I “got it.” We walked in, and shared in, the energy of the Women’s March. It was a magical day of warm sunshine, eagles soaring over us, fresh ideas swirling around us, and a feeling of inclusion like none I’ve had before. Hundreds of thousands of us, worldwide, were lifted to a new place by our realization that non-violent activism has power and I was furious when the pundits said it was a feel-good moment that would come to little or nothing because there were too many issues and too many voices. On January 28, on the streets of Seattle, there was no competition among issues—we were drinking in the connections we had with each other. And that is the where the power is!! ALL, every one of our issues, intersect! The intersections are the places on J. Herbert’s streets where the future waits. Intersectionality. My new favorite word. Now, in September, PEC is meeting in the Columbia River Gorge, both in the room, by the river and by the train tracks that carry this nation’s oil to the West Coast ports. We will be with the tribes whose lives depend on that river, its fish and its waters. We will stare into the facts of the Doctrine of Discovery, walk the labyrinth, hike the trails, hear Dr. Barbara Rossing explicate Revelation and its messages about our care for the earth. Paul Galbreath and the worship team are using the intersections of 2+ cultures to create worship that is about this place and time in Oregon. The Strathdees, our musicians, are legendary for respecting and learning from the music they have heard and learned from the tribes. Oregon’s 8th Poet Laureate, Elizabeth Woody, will be at Celilo Falls to tell us hard things with beautiful words. Her very life intersects the indigenous and European cultures. If you come, and you must come, we will work with you (if you will allow us to do so) to prepare you in advance for this experience. We want you to bring your own watershed stories and to know something of the tribal culture that lives under the foundation of your home, business and church. We who live in this country, indigenous or otherwise are part of this story. I’ll meet you at the intersection of Sacred Stories and Reconciliation! Rev. 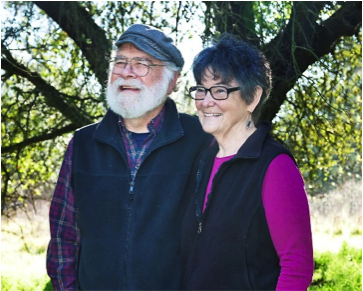 Holly Hallman, retired hospice chaplain, hopes she will not have to be a hospice chaplain for all the critters, watersheds and people who live in and love the Northwest. She and her husband, Fred, are waiting to meet you at Menucha! Rev. Dr. J. Herbert Nelson was then Director of the Office of Public Witness. He is now the Stated Clerk of the PC(USA) General Assembly. Rev. Dr. Paul Galbreath is a professor of theology at Union Presbyterian Seminary.